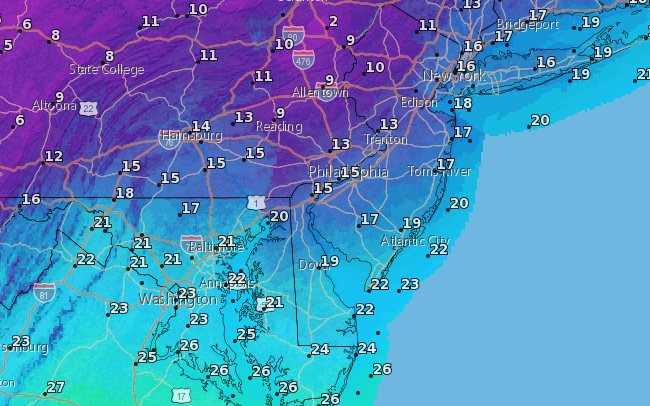 A cold front will bring a wide-ranging number of weather conditions to the Shore area this week, starting rain, then snow, followed by an arctic blast that will send temperatures plummeting. There could be some flurries during the morning hours on Tuesday, but there will be no accumulation, according to the National Weather Service. The precipitation is forecast to move in during the evening hours. The NWS is calling for a rain and snow mis before 11p.m., then a chance of snow between 11p.m. and 1a.m. The overnight low will be around 22 degrees with a southwest wind of 10 to 18 m.p.h. Winds could gust as high as 32 mph. New snow accumulation of less than a half inch is possible. On Wednesday, there will be a slight chance of snow showers after 10 a.m., then skies will turn mostly sunny, with a high near 30 degrees. It will be breezy, with a southwest wind 14 to 22 m.p.h., with gusts as high as 40 mph. Chance of precipitation is 20 percent. After the precipitation has moved out, temperatures will plunge. It will be sunny Thursday, but with a daytime high of just 18 degrees. Friday will not break the freezing mark either, with a high of 25, nor will Saturday with a high of 23. Only on Sunday will the mercury rise above the freezing mark, with a high of 42.